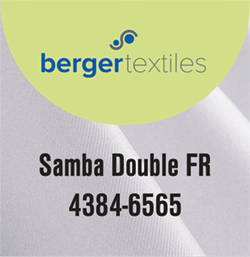 The award winning be.tex® Samba FR as a double-sided-version. Both sides are white and equipped for UV-, Latex- and solvent-printing. Its also usable as a blockout media with white back. Features like crease free, folded shipment, etc. The media is curl free that makes it the perfect choice for roll-up applications. This product does not fray and has a 1-2% stretch. For banner/pop-up stands, frame systems, banners, blockout. Compatible with solvent, UV curable, latex.